Wasted potential is a sad sight to see. Showmances cloud the judgment and can cause the ruin of several powerful players in Big Brother. This season saw early on the effect of how showmances lead to potential strong players being evicted one after the other. This evicted player's girlfriend was evicted earlier and it was only a matter of time before it happened to him. 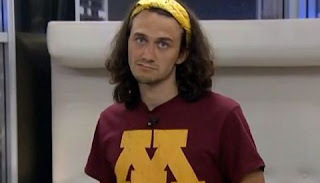 The fourteenth person evicted was McCrae Olson, the 23 year old pizza delivery man from Minnesota. McCrae is the funky super-fan that served as the second half of this season's powerful showmance with Amanda. He won the first Head of Household (HOH) and joined the Moving Company, a secret all-male alliance with Nick, Spencer, Howard and Jeremy. This alliance crumbled when they plotted Amanda's demise and McCrae took a backseat to the game. He barely did anything on his own and let Amanda overshadow his presence. He was nominated for the first time in week 9 but Amanda won the Power of Veto (POV) and saved him. The following week both him and Amanda were nominated together, he won POV and she was sent packing. The next two weeks saw lucky breaks by winning an HOH and POV that kept him safe for two rounds but his luck eventually ran out. On Day 84, he was evicted by a vote of 1-0. McCrae fell to the curse of the showmance. When players are in a powerful and cohesive pair, sometimes both tend to faze the other houseguests out and destroy their social game. Amanda, on the one hand, killed her own social game by being antagonistic while McCrae simply ignored everyone. He slept for hours and relaxed with Amanda; completely forgetting to build relationships and keep strategizing. Amanda was the mastermind and once she left, he made plenty of stupid decisions like nominating Elissa; arguably his only trustworthy ally left against the Exterminators. It was only a matter of time until McCrae couldn't win the competitions to save himself. Moving past his inability to play when Amanda was around, his first mistake was nominating Elissa. Had he kept her around, a bigger target would still be in the game and he'd have an ally. Beyond that he should have teamed up with GinaMarie and Judd to break up the alliance of Spencer and Andy since they're basically a strong pair. He should've pushed harder to target the right people instead of bending to the will of the house. McCrae is the super-fan that let down the super-fans. He got too comfortable, let his showmance dominate the game and showed his inability to separate from a pair. Many would've guessed he might win and I thought so for a while as well but after seeing Amanda's downfall, McCrae could never bounce back. I'm glad he had a fun summer and enjoy the last few weeks after the season when he's still dating Amanda. Let's be real for a second... that relationship won't last.